Chiva-Som means “haven for life”, and for the well-heeled guests who frequent this gorgeous spa in order to relax, de-stress and detox, that description is perfectly apt. Chiva-Som, located in Hua Hin, Thailand, is one of the world’s most famous spas, and its range of treatments, physical, mental and spiritual are well-reputed. For people seeking to rejuvenate themselves and their bodies, it’s a great place. For a foodie, however, the idea of spending 4 days in a spa, eating “health food”, i.e. close to no salt, sugar, fat, etc, was a little terrifying. On the 2.5 hour car journey to Hua Hin from Bangkok, I kept asking my wife is she didn’t want to consider pulling over for one last greasy but delicious bowl of…well, whatever street food we could find on the way. Her favourite response was a swat with her hand, giving me no more attention than your average pest, which I think she was beginning to think I was. Chiva-Som’s grounds are beautiful. This picture is taken just past the well-guarded entrance. 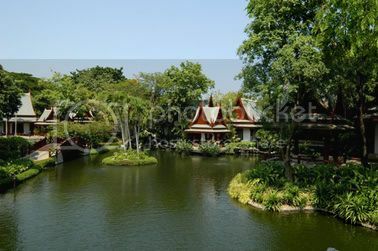 Further inside, past the villas, are the main facility areas—spa, gym, yoga pavilion, bathing pavilion, and more rooms. The hotel’s pool and Thai restaurant, Taste of Siam, sit closer to the rather attractive white-sand beach. All in all, a rather idyllic setting. Our first meal at Chiva-Som really scared me. Arriving just a bit late for lunch (past 2pm), we were quickly ushered into the Emerald Room, the hotel’s international restaurant, and presented with what has got to be the healthiest buffet spread I have ever seen. Lots of raw and grilled veggies, a few salads—Thai and Western—and some other food items that I am sure would look palatable to a rabbit but not to yours truly. I was really beginning to fear that the next few days, I’d be living on multi-grain muffins and self-pity. Fortunately, my wife asked if there was an a la carte menu. After a couple minutes of twisting our waiter’s arm, we found out that, in fact, lunch came with 2-3 hot dishes made upon request, but because we were late, they were hoping we wouldn’t order them. Of course, we did. And I am so very happy we did. After a few minutes, we were presented with a spinach-ricotta parcel wrapped in philo with a red pepper sauce and a plate of green curry with seafood and brown rice. And both, while incredibly light and healthy, were delicious! Can’t wait for Part 3 of your Chiva Som experience..do share (if u can) the experience of spa cooking and recipes. I am a big fan of spa living and cuisine. 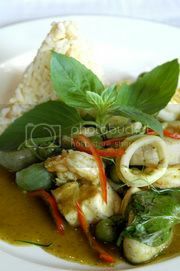 Wud love to make a thai green curry w/o the ubiquitous coconut milk! Sawadee.